Reach our targeted audience of lawyers who work in a private practice that is located and/or provides services to clients within the San Diego County area. Let our innovative advertising, marketing, and writing team tell your firm’s professional, insightful and inspirational story of success. Let us help you further establish your leadership within your area of expertise, among your peers and provide you and your firm with valuable, tailored content that’s exciting and interesting for our readership and your potential clients researching online to learn more about the specialized services your firm provides and learn what makes your firm unique. Attorney Journals are experts at producing tailored, honest and visually exciting content that potential clients are researching for on and offline. We can also help you create measurable marketing campaigns that can be delivered within very short timelines – ensuring your ability to monetize opportunities caused by the dynamic nature of corporate and legal landscapes. Many legal trade publications are focused on creating content for lawyers by lawyers, as are we. However, we also create content by lawyers for the corporations, businesses and the educated general public that are online researching for very specific legal services. This important area of difference means that your message reaches potential “clients” for new business, not just your colleagues for potential referrals. Our writers, photographers, editorial and graphic design team will work with you to create a unique campaign that will allow you to stand out from all the clatter of traditional display-only advertising and help your story/message reach “all” the audiences that are important to your success, not just lawyers. Unlike traditional advertising, which consumers and colleagues are used to, Attorney Journals sponsored cover and inside feature profiles provide targeted content to multiple targeted audiences – allowing firms to accomplish their brand goals faster and for a lot less money than traditional advertising. 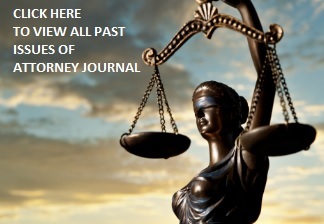 Attorney Journals’ sponsored cover and inside features are honest, inspiring, educational and captivating content – this ensures the highest ongoing interest from our controlled readership and potential new clients researching online.